Every sport provides players with the opportunity to learn life lessons on the field. Few sports offer life and career lessons as influential as the lessons I learned playing Rugby. I was introduced to the sport right after I graduated high school. I knew very little about it, other than it was a rough, full contact sport. I also knew there were a lot of people who believed girls were not cut out for such a rough sport. 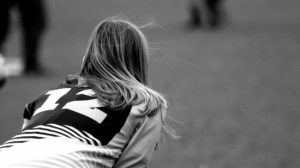 Being fiercely independent and wanting to prove to my world girls were a force to be reckoned with, I decided to become a rugger. 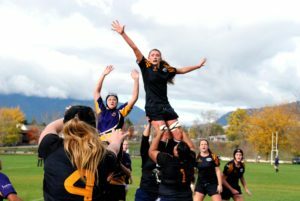 At the time, I did not realize my decision to play rugby would be so pivotal in my life and instrumental in my career. The experiences and lessons I learned, on and off the pitch, formed a foundation that shaped my character and defined my career. If you look out on a rugby field, you will see mix of ages, races, heights, weights, statures, and builds. 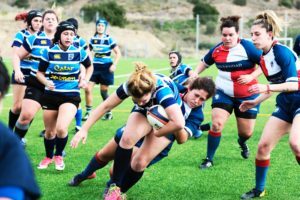 Rugby is also one of the few sports where the rules and physical expectations are exactly the same, regardless of gender. There is no ideal type of rugby player and there is a place on the pitch for everyone. Your speed, your skill, your strength, and most importantly, your attitude, determines where you will play on the field. Each player has something to contribute, and when properly positioned, fifteen significantly different players gel together seamlessly to accomplish remarkable feats. There is no other sport where a team’s success is dependent upon such diversity among players. The concept of starting with an even playing field and equal expectations resonated with me. I quickly learned embracing all aspects of diversity in the workplace did exactly that AND it made the team more successful. Just like it did in rugby. I strived to contribute and foster an environment where people, from all walks of life, could be positioned to bring their talents together for the greater good. Rugby players spend 80 minutes getting stepped on, kicked, tackled, pushed, and knocked down while putting forth a tremendous amount of physical effort driving the scrum and running the ball. While on the field, adrenaline runs profusely through our veins and our emotions reach new heights during the match. It’s a challenge to remain calm and collected when the referee makes a bad call, when someone intentionally knocks you down, or when a teammate doesn’t do what they are supposed to do. Whether it’s the referee, an opponent, or a teammate; in rugby, we never fail to respect one another. We refer to the referee as “Sir” or “Ma’am”, we don’t question their calls, and we shake the hands of each opponent at the end of the match. We leave our blood, our anger, and our glory on the field. We go into the “third half” celebration with our rivals, treating them like they are our honored guests and our best friends. The value of respect followed me off the field and into my career. Because of the lessons I learned in rugby, I entered the workforce knowing how to effectively work with others to achieve a goal. I recognized how to respectfully state my position and stand up for what I believed to be right. Most importantly, after the debate, I knew how to treat my counterparts with respect, regardless of the outcome. Rugby is rich with traditions and rituals. Every rugby club has their own set of traditions and rituals. Many of my favorites took place during the “third half”. After a match, the opposing teams come together to bond over stories, songs, and a variety of friendly competitions and rituals that only a rugger can appreciate. There is only one rule… do not shower! You show up as you are; muddy, bloody, sweaty, and sore. Your hair is tangled from the scrum and the only make up allowed is in the form of mud or blood. You show up raw and unfiltered. In exchange for your vulnerability, you are extended a kindness like no other, as a team of strangers welcome you for who you are. In a world filled with Snapchat and Instagram filters, it can be hard to tell what is real and what isn’t. Rugby provided a safe place for everyone to be real and feel accepted. This type of acceptance is a rare form of recognition that builds tremendous loyalty and respect; a lesson that I carry into the workplace and practice daily. Rugby teams are made up of talented athletes who understand their strength exists in their ability to unite and work together. It may not look like it on the field, but rugby teams are astonishingly organized. Each position has a specific purpose and role on the pitch. Every player knows exactly what is expected of them…every play…every time. There are no “all stars” or “show off’s” in rugby. Everyone is fighting together for the same goal. 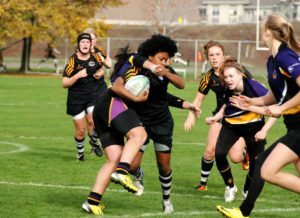 When one player goes down, she is backed by players who ruck over her to protect both her and the ball. All fifteen players have to work as a cohesive and synchronized unit if they want to win. Off the field, this lesson taught me to recognize how my personal success was largely dependent upon the successes of my clients, partners, colleagues, and employees. Supporting one another and working together to bring out the best in each other was what defined our success and is the core of what I practice today. Rugby players are no strangers to adversity. We get knocked down, we get back up …we get hit, we work through the pain…our bodies grow weary, and we continue push ourselves because we believe there is another play, another chance, to reach the goal line and score a try. We wear our black eyes, broken noses, and bruised legs with pride because it’s our proof, that we gave our best effort. We learned on the field that we have to persevere and keep going if we want to reach our goals. I believe this is why rugby players develop a mental toughness, which allows them to persevere through the hard hits play after play. Developing resilience enabled me to endure the hard hits life threw my way. I would get up and try again, always believing there was a way to achieve my goal or get through the dark days. When I joined the rugby team, I expected to be challenged. I also expected it to be accompanied by good times, great memories, and forever friends. I never expected I would also learn valuable lessons that would influence my life and career. It’s ironic that a sport once viewed by many as “inappropriate for girls” to play, has become one of the fastest growing women’s sports in the U.S. I like to believe it’s because people are able to see how values and lessons like these are learned in rugby and how they have defined the character and careers of so many incredible, strong, and influential women in the workplace today.